At PSS not only do we strive to provide the best veterinary equipment, but we also strive to ensure that you have the skills and confidence to gain the most from your kit. 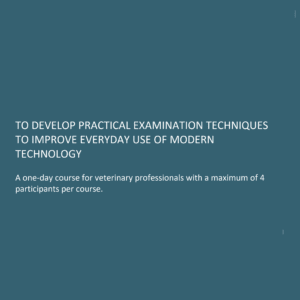 We provide a number of Continuing Professional Development (CPD) courses for veterinary professionals as we believe in helping our customers to improve animal care. PSS CPD courses are designed for all levels, from graduate to the advanced practitioner. Our courses are not only designed to develop your theoretical knowledge, but they also involve hands-on learning to improve your practical skills. Tailored specifically for the veterinary profession we are confident that you will gain the latest skills in key clinical subjects. For more information or to request CPD on a topic that you would like to see listed contact us today.